Produced in cowhide, this jacket's interior is composed of a bubble fixed lining with honeycomb structure to facilitate a steady micro-climate on the inside. With composite protectors on shoulders and elbows. The inserts in elastic fabric on the armhole and arm enhance movement and comfort. Also comes with adjustable waist fastening and jacket-to-pants zipper. 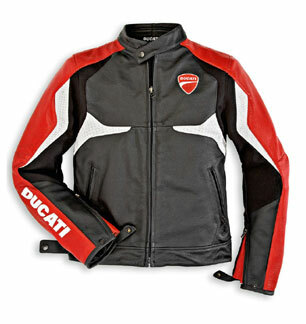 The Ducati identity is evident in the logo on the front and the red on the sleeves. The back has the Ducati script in white in a Corporate style. For diehard Ducatisti.